With most of the focus on the Hall of Fame voting, football playoffs and other non-baseball related news so far, let's talk about Justin Upton. With the 50,000 other articles out there about what it could mean for whatever team may acquire him, the prospects said team would give up and the impact on the teams that didn't get him, what's one more blog post going to hurt? The most we know at the moment is that the Mariners and some other teams are still trying to acquire Upton. One of those teams is the Texas Rangers because we all know they need more offense in the form of an outfielder. But enough about the Rangers. How would acquiring Upton effect the Mariners now and in the future? Rather than going through every possible scenario and every possible player involved in the trade, there are only two that are discussed after the jump. One is Upton and the other is Taijuan Walker. Actually, if Walker isn't in the deal if one gets done, I may end up completely black and blue from pinching myself. To tackle the now part of the question, they'd have an outfielder who can hit the ball better than any other current Mariner can. At least, he has the ability in him to do it. His breakout season was 2011 when he hit .289/.369/.529, a 141 OPS+ and 31 home runs while providing some speed on the base paths with 21 steals. That season, he finished fourth in the NL MVP voting and won himself a Silver Slugger. 2011 was his breakout campaign, but 2009 saw him put up a solid season also. His slash line was nearly identical to 2011 but with 26 home runs and 20 steals in 21 fewer games. He hasn't been the most durable of players, playing in 159 and 150 games in 2011 and 2012 respectively, with a previous high of 138 in 2009. Even so, his WAR in 2011 was 5.7 according to Baseball Reference. The FanGraphs and BR versions vary to some degree, but as a number to put on a player for overall value, either one works. The 5.7 WAR in 2011 put Upton sixth for all position players in the NL that year. Last season, Upton put up solid numbers, but was considered disappointing for the type of player he should be. He hit .280/.350/.430 with 17 home runs and 18 steals with a 2.1 WAR, which I'm sure was helped immensely by his defense. It came out late in the season that Upton played with a hurt thumb for most of the season and those who saw Justin Smoak fall of the map can attest, a hurt thumb does nothing for your offensive value. And no, that's not Smoak's only problem, but it gives you an idea of what can happen to a player when he hurts a seemingly mundane appendage. All of Upton's accolades to this point have been done at a young age. He's signed for 3 more years and he'll be entering his age 25 season in 2013. For Upton to sign off on a trade to the Mariners, he'd probably need to be offered more years and more money, but I don't see that as being a massive issue unless one of his arms falls off at some point during the contract. He's a young player under team control for several more years who can provide a spark on offense and provide fairly good defense. He's a player that carries some risk in that he was injured last season and has only found his stride in one season so far. Upton's a potential offensive monster now and in the future, but until he proves he can do it on a yearly basis, it's still only potential. That takes care of the acquisition side. What about the giving up side? Contrary to what the Dire Straits say, you can't get money for nothing, which in this case means Justin Upton. You've got to give something up to get him. The one player any package for Upton would start with is Taijuan Walker. If you think the Mariners can get Upton while still holding on to Walker, you're kidding yourself. The Diamondbacks are looking for young starters after giving up Bauer last month and it's a safe bet that Danny Hultzen or James Paxton will not get it done. Is it possible that Hultzen and Paxton could go with Walker staying put? Yes, it's possible, but I just don't see that happening. Walker is one of the top pitching prospects in the game and that's the kind of talent you have to give up to get the talent you're looking at acquiring. Prospects, until they reach the majors and prove themselves, are nothing more than bargaining chips and carry a huge risk throughout their development. It's entirely possible Walker could end up being the next Tom Seaver, but it's also possible Walker is the next Ryan Anderson too. Remember him? He was "The Little Unit" when he was in the Mariners system after he was selected in the first round of the '97 draft. He's currently working towards becoming a chef. Walker is entering his age 20 season after having already pitched a full season in Double-A in his age 19 season. He got hit around some in the second half of the season and ended up with a 4.69 ERA in 126 2/3 innings. The ERA really doesn't mean anything in the minors though, especially in Double-A with a very young pitcher still working on a lot of things. To give you a better idea, in those 126 2/3 innings, Walker allowed 50 free passes and struck out 118. That's a helluva season for a 19 year old in Double-A. Even so, the odds he starts 2013 in Double-A and gets a promotion to Triple-A at some point in the season are pretty good. A September call-up is possible, but not very likely unless he's absolutely lighting up the hitters. At some point in 2014 is probably the earliest anybody can realistically expect him to be in the starting rotation in the big leagues. The point is, Walker is, in all likelihood, still at the very least a year away from even sniffing the majors and a lot can happen between now and then. He could take a step back in his development, blow out an elbow, a shoulder, a knee. You can't sit there and say "Well that's not going to happen" because you don't know either. If people knew if an injury was going to occur 6+ months down the line, nobody would ever get traded. Trading an unknown for a known can backfire, yes, but is also the best way to go. This could all become moot if Upton ends up getting traded to a different club, but since the possibility is out there, why not see what's what. I'd be happy if the Mariners ended up trading for Upton without gutting the farm. I'd be ecstatic and going for a drug test to make sure I wasn't on something if they trade for Upton and Walker isn't a part of the deal. There are other players that would probably be involved, like Hultzen, Paxton, Maurer, Franklin, etc. Going through them one by one would be a nightmare to do with all of the possible player combinations. If a trade happens, we'll look at the players involved. 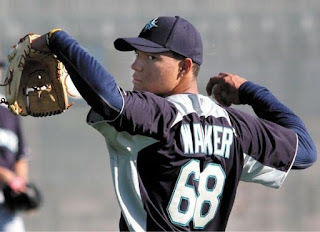 The one thing I'd bet the farm on, however, is that Taijuan Walker would have himself a new uniform for 2013 if a Mariners/Diamondbacks trade goes through.